Posted in: Games, Guild Wars 2, MMOs, Uncategorized. Spoiler Alert. 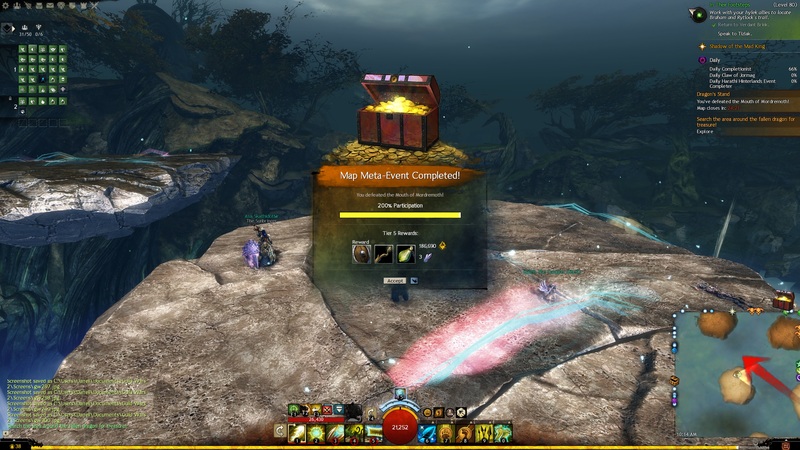 I’m going to talk about my experiences with one of the largest “Meta Events” in Guild Wars 2. 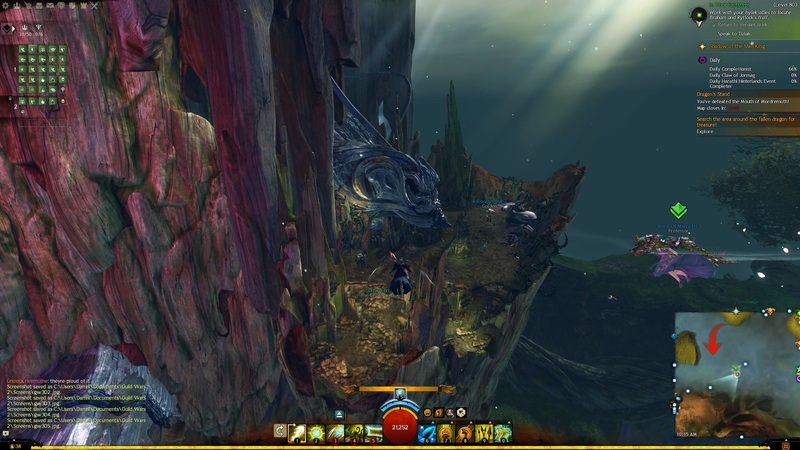 This is not a “Walk Through” or a “Guide” but a set of impressions, and a link to a ton of Pictures that will give you a sense of the chaos and scale that are events in Guild Wars 2. 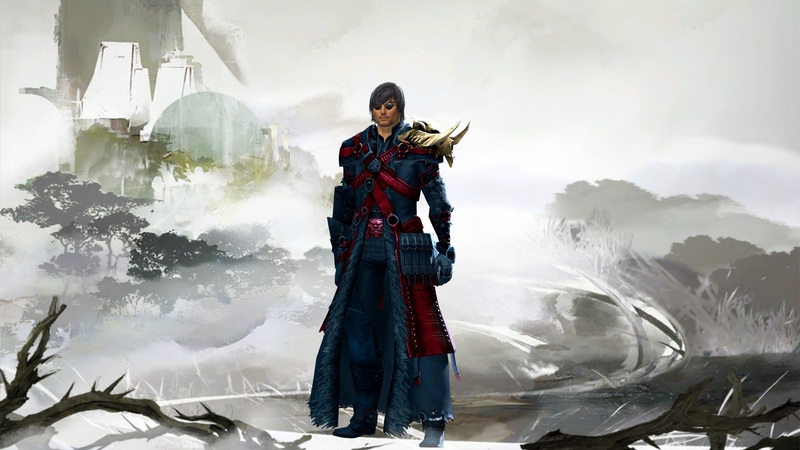 Let me start by saying that until you experience a Guild Wars 2 Open World event, you will probably not get it. 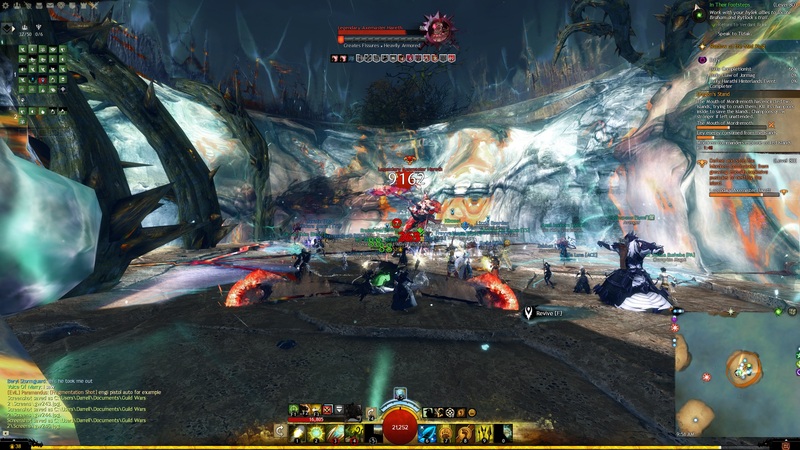 While GW2 has Raids and Dungeons, they pale in comparison to the scale of the Open World meta events. And I guess there are those who like the technical challenge of Raids or the closed in personal challenge of Dungeons. But personally, I find these Open World events awe inspiring. I hope to convey some of that inspiration in a few words and some pictures. Dragon’s Stand is a series of events in the Dragon’s Stand map and is the final episode of Heart of Thorns. 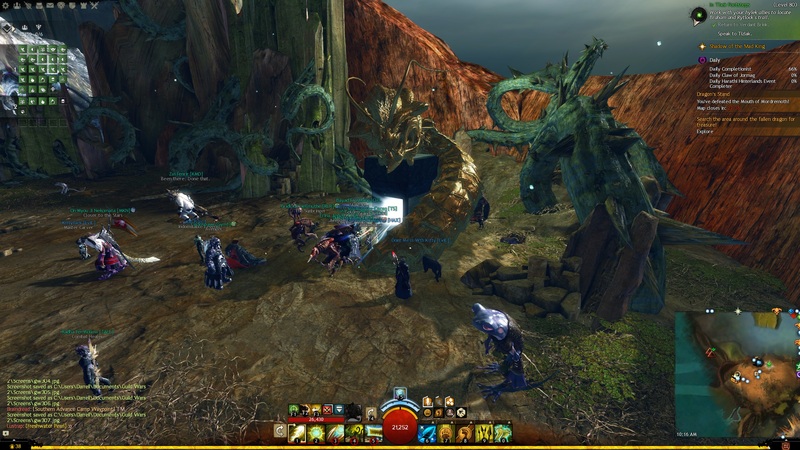 The above picture was taken during the final phase of the event where folks are scattered across about nine islands and are attempting to weaken and finally kill the Mouth of Mordremoth, which is the accessible part of the Elder Dragon. Let me start by pointing out some of the differences between an Open World Event and a Raid. 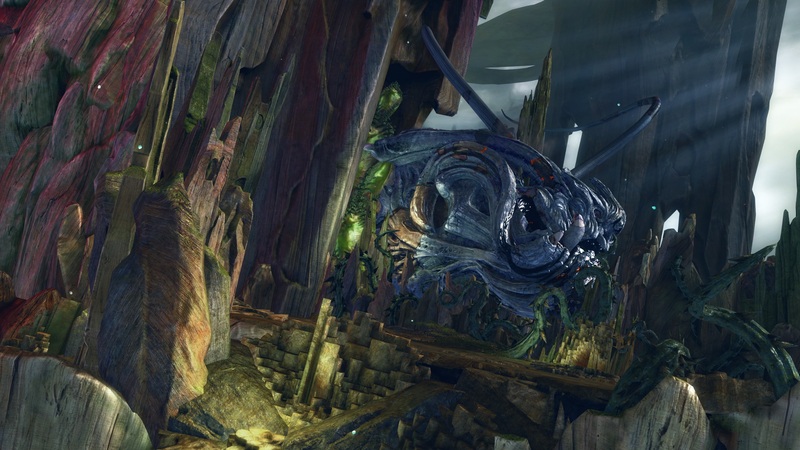 And Open World Event is a scripted event that occurs in the world [one or more maps] of the wide world of the MMO that is GW2. OWEs are not Instances. Raids and Dungeons are instances. If you are a player, you can walk in or out of an OWE at any time, and you will receive rewards based on your participation. And you don’t have to hit the boss to participate. For example if the event is killing the “Claw of Jormag” – which you can look up if you like – then if you walk in and just heal folks that are downed during the fight, over and over and use buffs you have on folks, you will get participation, for showing up and for helping others. No shots fired. The game rewards, generously, any type of participation in events. If you leave the event before it completes, you will still be rewarded based on the work you did. Your reward will appear automatically even if you are far from the event when it completes. You might miss out on a chest though. Those are not automatically delivered. As you can see in the upper right, there are 31 people in my squad, and in the background you can see many names that are green. Those folks are either in other squads or no squad. The reason to be in a squad is that you can see the blue dots on the map. Your commander – with a head tag – is a person to follow. Squad chat or party chat may help with some instructions, but honestly he is so busy just fighting that you won’t get much direction. Just watch for his markers – see the bulls Eye symbol – and shoot that. As you can see, this event starts off in Chaos as we circle the path time after time killing some sort of buffing agents of the dragon. There are so many foes that there is no way even this large group will be able to kill them all. This is not about tight organization, it’s about concentrated firepower and sticking together to heal each other if someone goes down. Run and Gun and Buff. After about 10 rounds or so, I didn’t really count, we broke off and headed toward the lake where the Mouth lives. This lake is huge. 3-4 miles across? Take a look from one of the islands. So, we “glided” out to the islands. There are two assists to get there. Updrafts and Ley Lines. Ley Line gliding is hard to get. I don’t have it. But I do have updrafts and have practiced a lot with those, so it’s pretty easy to get out about a – what 1/2 mile would you guess? – to the nearest Island? With Updraft gliding, you glide into an updraft, which are easy to spot, before your glide energy runs out and it maxes your glide energy and boosts you to a higher altitude. Just like you’d expect. So you can glide to the next one or your destination. Ley Line gliding is riding the energy waves that cross between the islands. It’s like a roller coaster ride. But it takes a lot of work to get that Mastery. And here’s where the Events are different than Raids or Dungeons. I can pick how I can best participate on the fly with no direction. I can’t Ley Line Glide, so I can’t quickly make it between islands. But I can defend an island. So I stay put and when a bad vine shows up I help kill it. Or when the mouth wraps the island, we drive it off. Everybody gets a chance to die here. See how big that suckker is? 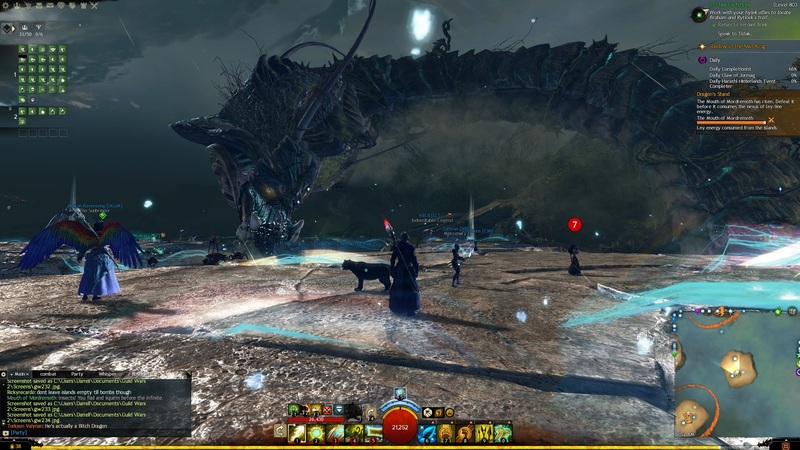 Raid and Dungeon bosses are tiny compared with this multi-mile long dragon and that’s just his mouth. And the good news, you don’t have to be an expert. Everybody helps everybody else. No dissing the player that is not the expert. The Experts do their Expert things and those of us who are competent get full participation without the bad language and trolling. Yes, you must play and build Mastery to do this event. 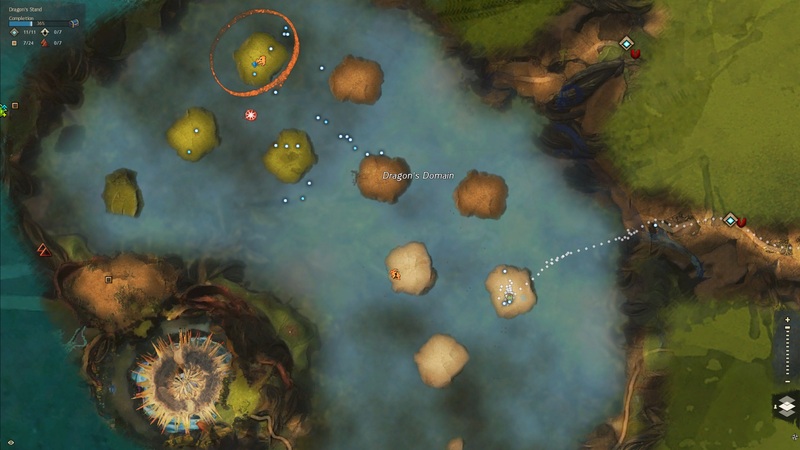 You need to learn gliding up through Updrafts and work your way through the maps to Dragon’s stand. You need Exotic, but not Legendary gear. By the way, you can learn to craft Exotic gear in this game including weapons, armor and jewelry. You need to train and polish your skills so you can stay alive. If you die too easily you will be left behind. But if you do that, you can join 100 other people to kill the Elder Dragon. Some rewards are brought to you. But the rest are in the Chest on the Island. 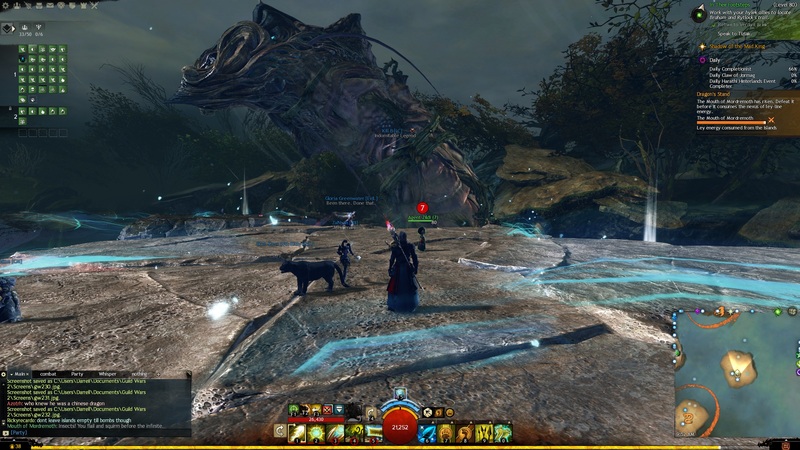 I think GW2 really has a great innovative design for Open World Events. I’m hoping that Wow and lots of other games will bring this kind of events to their games. Raids seem boring by comparison. I stopped playing Tera. They don’t get it. They are short cutting PvE in favor of PvP and doing Dungeons and a few Raids. It’s all cramped indoors for them. All just grinding for better and better gear to grind for the next. 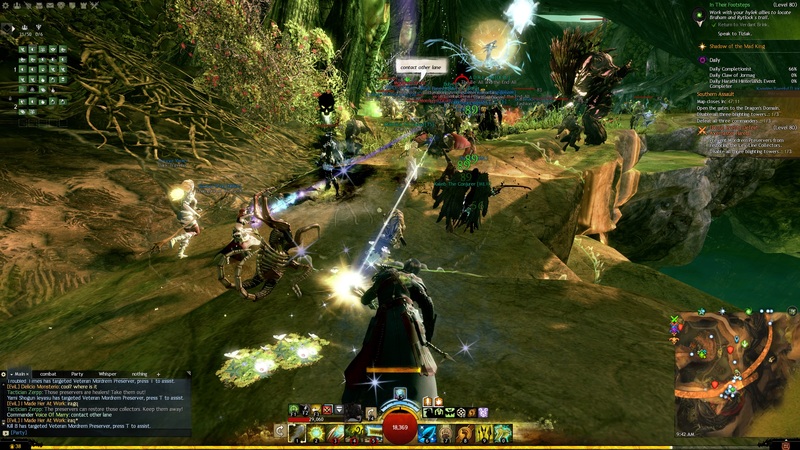 GW2 is level capped at 80. All the fun begins after you reach there and Exotic gear is good enough. You can grind if you like for Legendary gear for the about 7% bonus it gives you. But the Masteries of HoT are not really a Grind. And these events are fun. I didn’t plan to do an event this morning, but I was near where one started and I joined in. For Tyria and the Pact!